Since our nephew and travel buddy Steven had a jam-packed summer, we didn't have a chance to hit the road with him this year. Nor had we taken a leisure trip this year with Nanamama (Dianne's mother), who celebrated her 87th birthday in July. So when we learned that Steven's fall break was otherwise unbooked at a time Nanamama was also free, we decided to hook up with these two, who love to spend time together, for some travel. 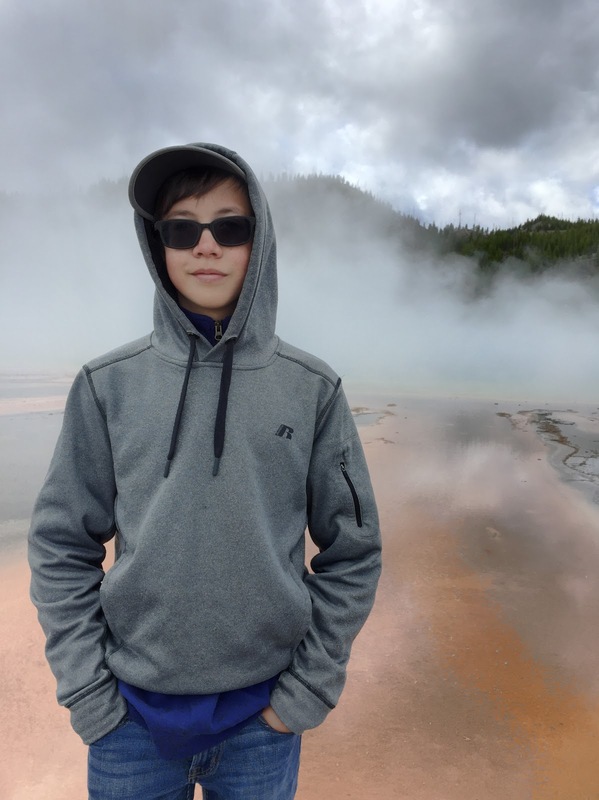 Steven just turned 14 and though he travels every chance he gets, it wasn't difficult to find a place he had yet to visit. ANYWHERE BUT YELLOWSTONE, WE'D THINK THIS WAS A BRUSH FIRE. 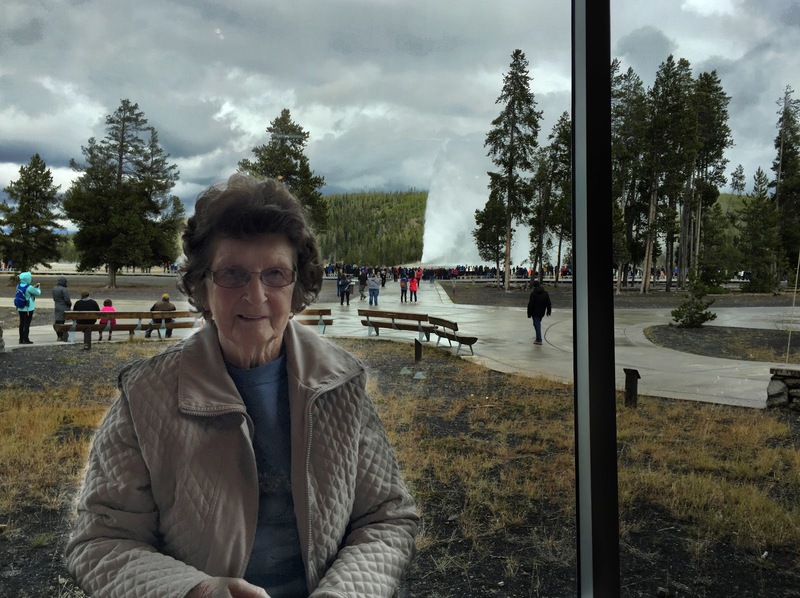 Nanamama, on the other hand, has been to all 50 states, most for multiple times, and has checked out many national parks. One place she had not been, nor had Steven, was Yellowstone National Park, the first national park in the U.S. and in the world. It seemed the perfect spot and in October, it wouldn't be as crowded as the crazy summers there. So we drove to Alabama, picked up Nanamama and ferried her to Nashville, where we connected with Steven and flew to Bozeman. 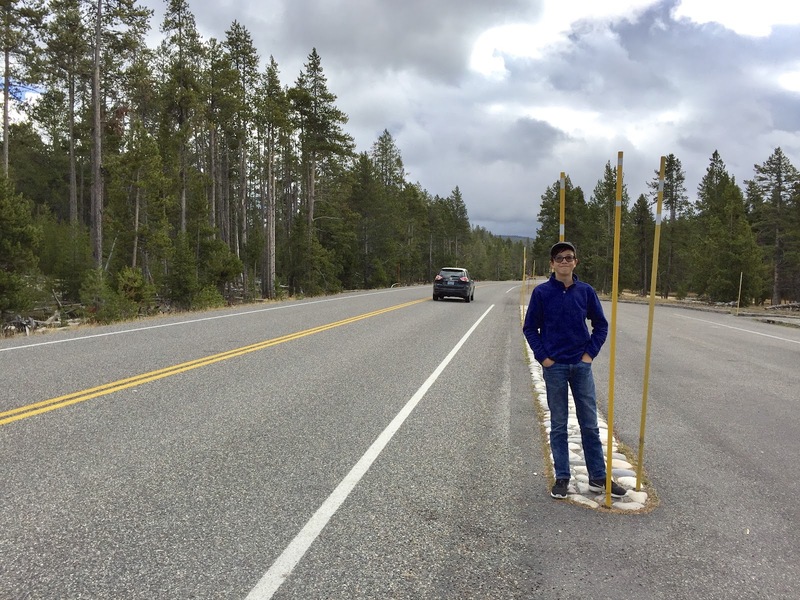 After getting our rental car, we embarked on the scenic drive down US-191 to the town of West Yellowstone, our HQ for visiting the park. 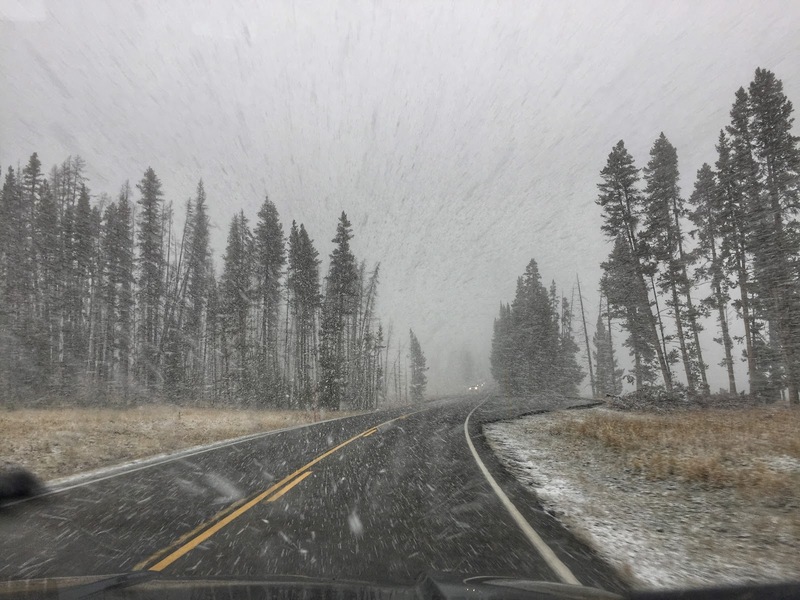 During our time at Yellowstone, we managed to hit all the high points and experience a wide range of temperatures and weather. WE GAUGED THESE TO BE 8 FOOTERS. On the way down 191 and after we got into the park, we noticed that the tall poles had already been installed roadside to guide snow removal crews and other drivers. These brightly colored snow poles improve visibility and lower the risk of running into fixed objects such as guardrails. After much discussion about the height of these safety gadgets, we finally asked almost six-foot Steven to help us estimate their span. THIS BULL ELK GREETED US NEAR THE PARK'S WEST ENTRANCE. 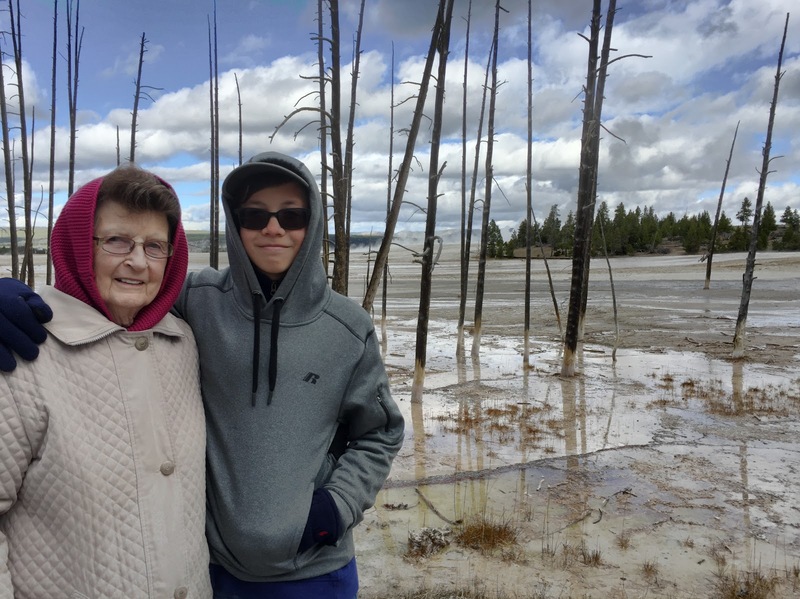 Nanamama was our official wildlife record keeper and tallied our spotting of an amazing variety of animals during our stay: 169 buffalo, 12 swans, 16 elk, 96 Canada geese, 48 ducks, 1 eagle, 23 ravens, 2 chipmunks, 18 horses, 10 mule deer, 1 hawk, and 31 anglers, most in hip waders standing in the shallow Madison River. 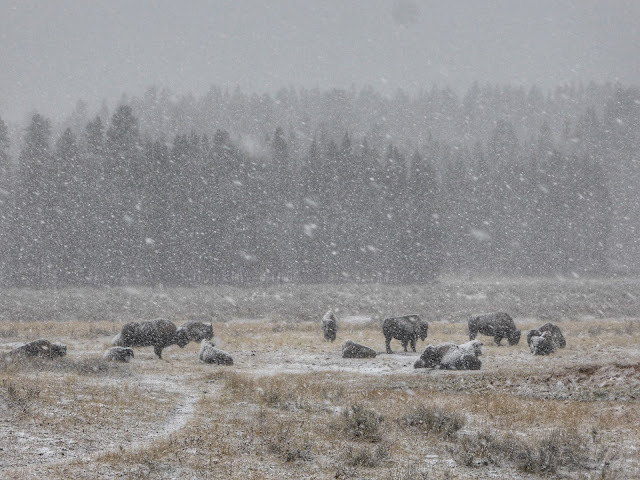 Of course, the buffalo were the ones we were most excited to see, especially when we caught sight of some during a snowfall. And just like in the iconic Yellowstone photos, they seemed completely unperturbed by the icy flakes coating them. In addition to the wildlife, of course, the other feature of the park that our first timers enjoyed most was the thermal activity. "This is so cool!" Steven said. "I mean, I know it's hot, but it's cool." 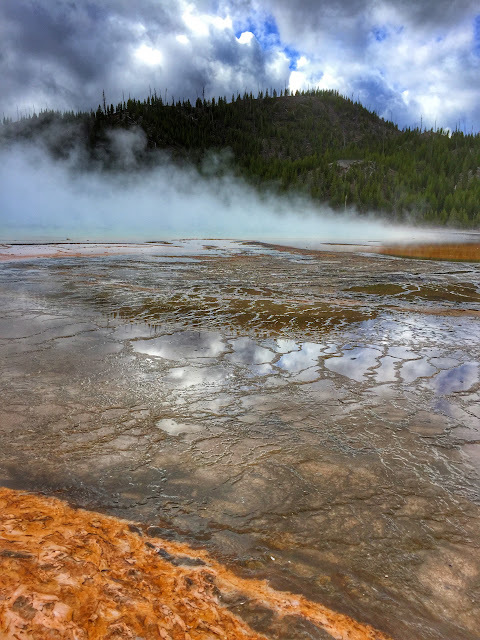 STEAM HIDES GRAND PRISMATIC SPRING AT MIDWAY GEYSER BASIN. AS THE STEAM DRIFTED, WE GOT A BIT OF A LOOK AT THE FAMOUSLY COLORFUL POOL. 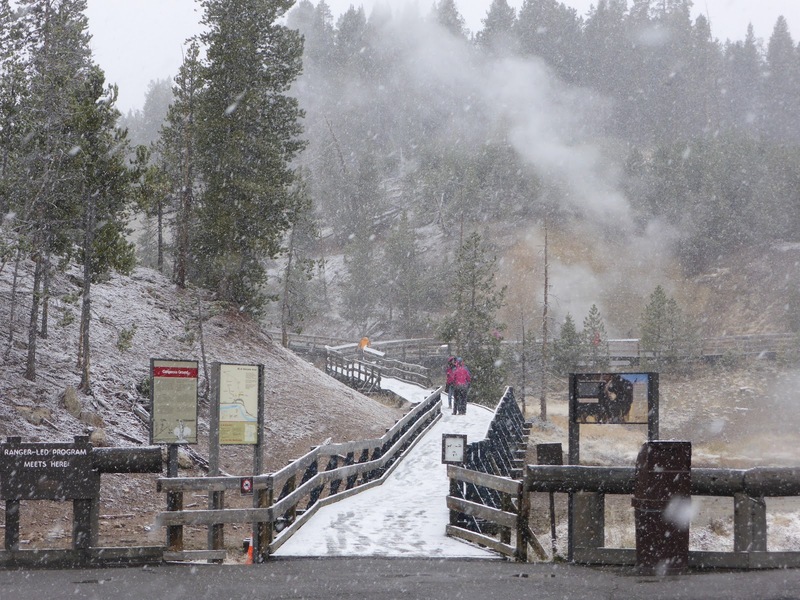 It's no surprise that the geyser we all wanted to see was the park's most famous—Old Faithful. 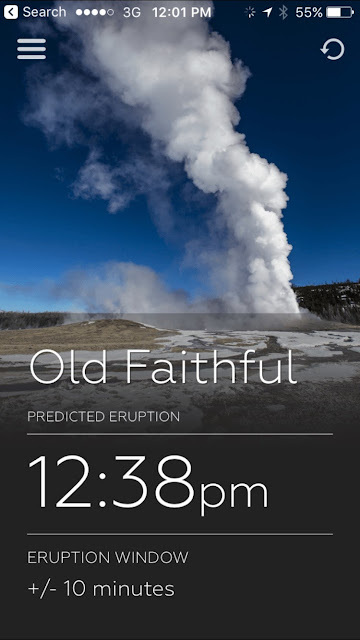 Conveniently, Yellowstone has issued an app about its geyser fields, and included in the app's features is the Old Faithful projection. This made it super easy for us to time our arrival at the famous spout's location. With our inside knowledge we arrived at the Old Faithful Visitor Center just in time to park, get our National Park passports stamped, and find a viewing spot. There were plenty of visitors, even in October, but the wise people in charge of this feature know Old Faithful has lots of fans and provided an expansive viewing area for an audience in the thousands. Like the genteel Southern lady she is, Nanamama opted to watch Old Faithful's show from the comfort of the excellent viewing room of the visitor center. With temps in the 30s and wind adding more chill, I decided to join her there while Ken and Steven hiked off to the outdoor observation area. 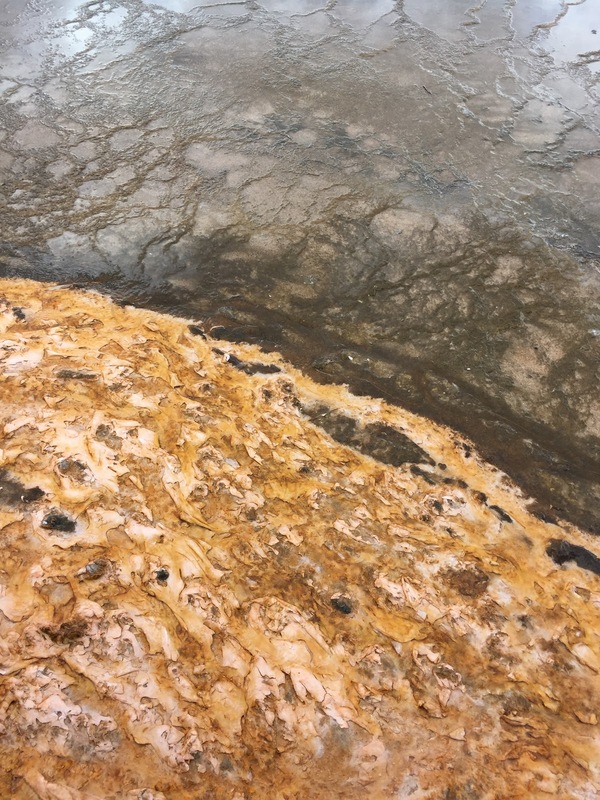 As an added treat, a few minutes before Old Faithful was due to perform, nearby Bumblebee Geyser began erupting, spouting steam and water 40 feet. Since this less famous gusher is active only every 15 hours, we were exceptionally lucky to see both at the same time. DON'T LOOK AT OLD FAITHFUL ERUPTING. POSE FOR A PHOTO. With that introduction, Old Faithful waited until the Bumblebee settled down and put on a stunning show of its own. After reconnecting with the guys, we all drove out to a picnic area near the Continental Divide for lunch. EVEN IN OCTOBER, THERE WAS A SHORT LINE FOR THIS PHOTO OP. 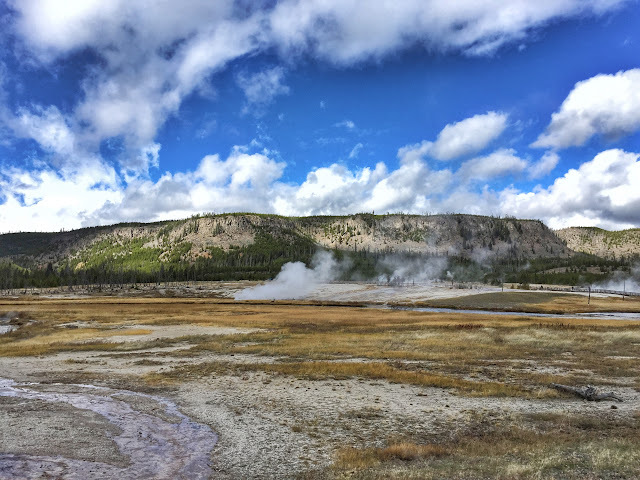 In addition to the wildlife and the geysers, which we saw in great numbers, the third best feature of the park is its landforms. Second to none is the Grand Canyon of the Yellowstone River. 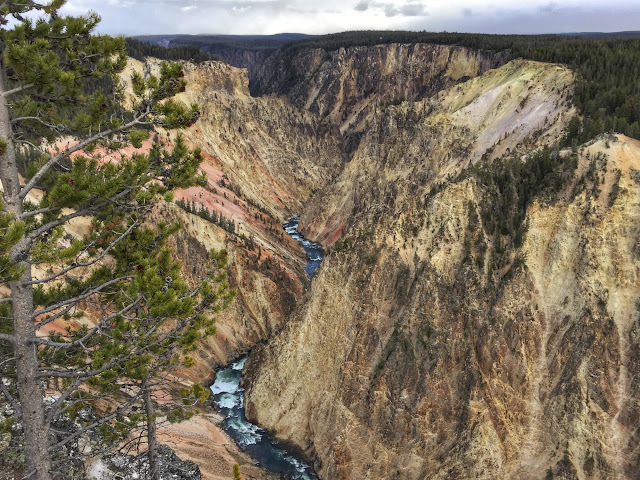 The view of the turbulent river roaring through the bottom of the canyon is one of the park's most breathtaking sights. 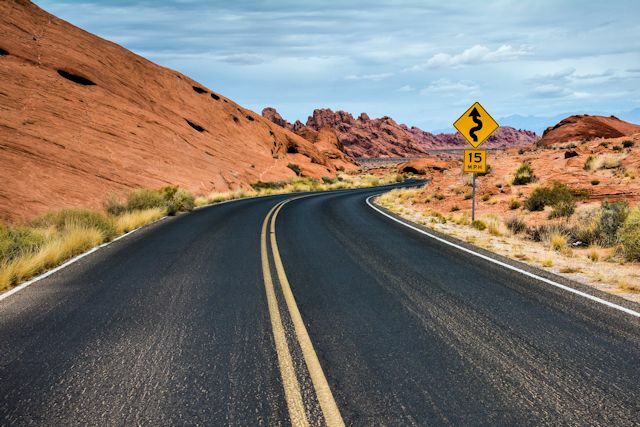 THE CANYON STRETCHES 20 MILES LONG AND A HALF MILE WIDE. The four of us had a superb time together seeing all we could of this magnificent American landmark. We'll let the pictures finish the story. NOTHING SAYS 'YELLOWSTONE' LIKE A BIG BULL BISON. 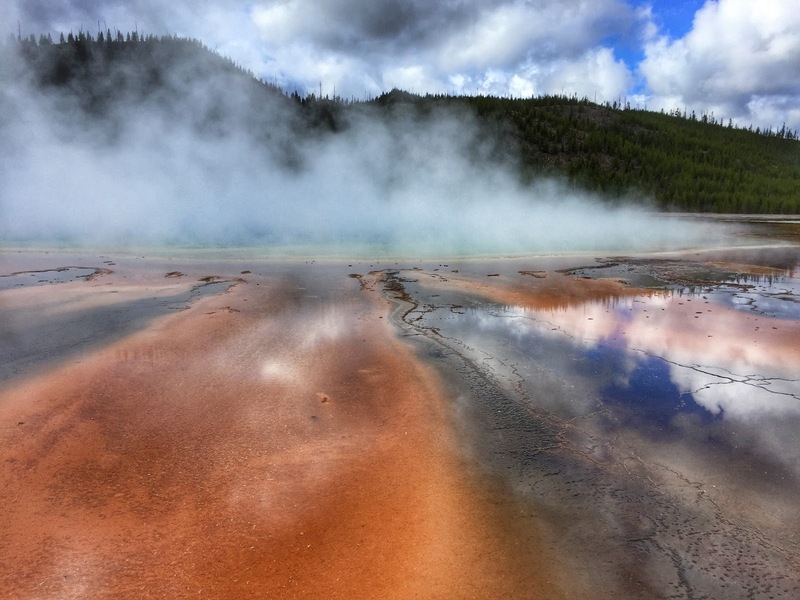 HEAT-LOVING MICROBES GIVE THE SPRING ITS COLOR. WEATHER CHANGED IN THE SPAN OF MINUTES, FROM HEAVY SNOW TO SUNNY AND CLEAR. THIS EXCEPTIONAL VISITOR CENTER OPENED IN 2010. WE ALL LOVED THE COMBINATION OF SNOW AND STEAM. AW, SHUCKS! DO WE HAVE TO LEAVE?